*This is book #16/28 for my 2014 book challenge. You can take a look at the reading challenge here. Campbell Cooper has never been in love. And if the doctors are right, she’ll never have the chance. So when she’s told she needs a miracle, her family moves 1,500 miles north to Promise, Maine–a place where amazing, unexplainable events are said to occur–like it or not. And when a mysterious envelope arrives, containing a list of things for Cam to do before she dies, she finally learns to believe–in love, in herself, and maybe even in miracles, as improbable as they may seem. The Probability of Miracles, for one thing, is one of the more realistic books I’ve read recently. It also has one of the most gorgeous covers! I can’t say enough how excited I was that I finally found a book with some diversity in it. The main character, Campbell, is a half-Samoan and (I think?) half-Italian agnostic. It was refreshing. It was also refreshing, though a little unnecessary, to see another side of Disney World. I live in Orlando, have friends that work at the magical world of Walt and I’ve seen things myself that makes the glitter shimmer not quite as bright. It was cool to see this side written from the character’s perspective. One thing though…. it’s a shame that John Green cornered off the market for cancer kid books. I couldn’t help but compare this, and others before it, to The Fault In Our Stars. It wasn’t fair of me to do, but it was second nature. I couldn’t help but be bored by the lack of ….. well anything come mid-book and I kept hoping for the story to be just a little more. Once they actually got to Maine, though, I was able to really get into the story and it became a quick and pleasant read. Late last year I read a book called The F-It List. The book was about two teenage friends, one of which has cancer and asks the other to complete her bucket list for her. The premise was so intriguing to me, but I was so completely disappointed by how far the author strayed from what the plot was supposed to be. I felt misled and aggravated. 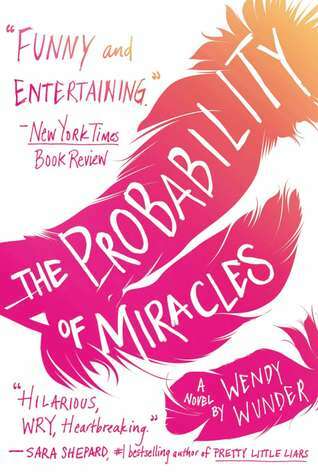 The Probability of Miracles also featured some bucket lists, and it was an added bonus that Wendy Wunder was able to do something as a sub-plot that I had so greatly missed from the other book. While I wasn’t madly in love with the book, I have to give credit to any work that brings me to tears – and a sprinkle of extra credit when that same book can make me laugh through my tears. The Probability of Miracles did that to me, especially toward the end. I feel like the characters were pretty fleshed out. Yes there were clichés and stereotypes, but I feel like the characters were able to fit those roles while also proving that not everyone is so easily pegged. I enjoyed each character, especially Cam’s Nana and the love interest, Asher. Which, as a side note, Asher is SUCH a Maine name. Despite all other things, the book was enjoyable. It wasn’t nearly as sob-inducing as other books I’ve read, but that actually made me like it a tad more. It just was as it should be. Ayuh! Go ahead and read my GoodReads updates for this title, if you are so inclined. I must say, they’re quite entertaining. It will tell you exactly what I was thinking on certain pages.